At The Floow we have music playing in the office through some wall-mounted power speakers. We wanted our staff to be able to control what is playing, skip tracks, change volume, etc. Initially we had Spotify running on a Mac Mini, using a home-made Rails website and some Apple Script commands to control skip, pause, play and volume change but naturally that was not very flexible, or reliable and created a maintenance burden when any new features needed adding. While looking into creating a better solution using libspotify came across the Pi Musicbox project which promoted the use of Mopidy. Mopidy is essentially a music server which supports plugins to add functionality, for example music services like Spotify & Soundcloud but also for control through web interfaces. 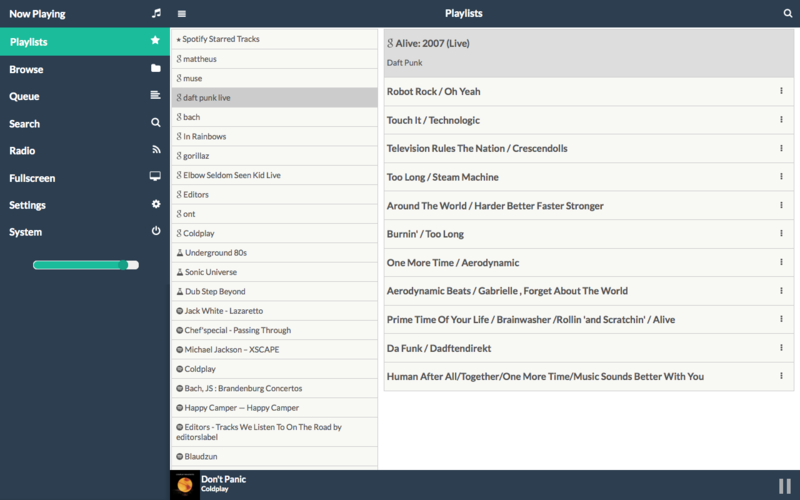 We started running Mopidy on a Linux Server with the Music Box web client (of the Pi Musicbox project). If all goes well you shouldn't need a keyboard or mouse for the Pi! This guide is based on running Linux on the computer used to prepare the SD card however there are many guides around the web on how to prepare the SD using Mac OS or Windows. Mac is fairly similar, most notably the devices are identified a little differently and you use diskutil to find and unmount your device before using dd. First download Raspbian Jessie Lite from https://www.raspberrypi.org/downloads/raspbian/ and extract the img file within. Then 'copy' the image to the SD card. This is done at the block level rather than the file level using the dd command. This step (usually requiring sudo) is destructive so you need to be sure which device is your SD card - using fdisk one can check. fdisk -l will list all disks, partitions, sizes. Again sudo is likely required. Or we can check the device list before, and after inserting the device. It's quite likely it will come after the last used letter, for example if you last device is /dev/sdc then it's likely to be /dev/sdd. Now the card should boot Raspbian in the Raspberry Pi 2. When powering up the Pi with a monitor connected it should boot into Raspbian and tell you it's IP. The Lite version does not boot into a graphical (X) environment so you will be presented with a login prompt. The authenticity of host '192.168.1.57 (192.168.1.57)' can't be established. ECDSA key fingerprint is SHA256:2pI1YWSU6pjrr0Q15kriKfuFjgIL4GwnWmDtLY1eyCA. Warning: Permanently added '192.168.1.57' (ECDSA) to the list of known hosts. The default username is pi and password is raspberry. I set it to musicbox. If your hostname does not match a valid DNS entry you'll need to update the /etc/hosts file. Note the last entry probably read raspberrypi which I have changed to musicbox. The steps here are based on the Official Install Guide for Debian. 0 upgraded, 145 newly installed, 0 to remove and 21 not upgraded. Need to get 39.3 MB of archives. The install should only take a few minutes - though that depends in part on the speed of your internet connection. 0 upgraded, 7 newly installed, 0 to remove and 21 not upgraded. WARNING    local/media_dir must be set. WARNING    spotify/username must be set. WARNING    spotify/password must be set. WARNING  Please fix the extension configuration errors or disable the extensions to silence these messages. INFO     Audio output set to "autoaudiosink"
The Warnings tell us that Spotify is not configured (and disabled) as is local media (which I'm not bothered about for now). The configuration for mopidy is stored within /etc/mopidy/mopidy.conf. The GitHub Page for the Spotify Plugin lists the configuration options available - as we pay for Premium we might as well have the highest bit rate! INFO     No local library metadata cache found at /var/lib/mopidy/local/library.json.gz. Please run `mopidy local scan` to index your local music library. If you do not have a local music collection, you can disable the local backend to hide this message. Now Spotify has logged in. The MPD server is Mopidy's own API (for which there are various clients). The HTTP server is where the musicbox web plugin is mounted. As the log line suggests it is bound only to the loopback interface, which can be verified using lsof. This means that right now no clients on the same network as the Pi can access mopidy. And if I browse to http://192.168.1.57:6680/ from another computer on the nextwork I am redirected to http://192.168.1.57:6680/mopidy/ which presents a page which in turn lets us navigate to MusicBox. Now we can see if it works. WARNING  Element doesn't implement handling of this stream. Please file a bug. Once booted you can tail the logs with tail -f /var/log/mopidy/mopidy.log to check everything is working as expected. We found at times the service got a bit stuck so we have a cron job to restart it at 7 PM which conveniently also stops the music should anyone forget. Note: The Raspian Jessie Lite image seems to have NTP installed as default so the time syncs regularly.